Players who have been playing for a while and want to expand their playing techniques and musical vocabulary. Each group will have their separate session for effective and faster learning outcomes. Sessions will go for 90 minutes. Instruments are available for beginners who don’t have a handpan yet. The workshops will be aided by written material and instructive sheets which explain the concepts, exercises and practices in detail. It is recommended you attend both sessions and spare some time during the week to practice. Workshops will be held at Yoga Moves studio in Paddington, Sydney (see the location button above for more detailed instructions). Baran’s handpan workshops were a huge help for me; showing new ways to explore my instrument, bringing new feelings and intentions to my playing and helping me to grow in my musicality and creativity. He holds incredible musical talent and knowledge, deep understanding of handpans, as well as a kind gentle compassionate teaching style with crystal clear communication. I highly recommend Baran’s workshops. I was fortunate to have Baran as my handpan teacher. Baran combines knowledge of music theory and practical skills in his classes. He is patient and adapts his teaching style based on student needs. I highly recommend Baran if you want to learn how to play music. In this workshop, fundamental and intermediate level Hang Drum & Handpan playing techniques will be shown. Practice methods will be demonstrated which will open new opportunities to your playing. The workshop will be based on individual playing. Each student will be distributed instructional sheets and notations. A limited number of Hang Drum & Hand Pans will be distributed to the students who don't own an instrument. Get ready for hang drum and hand pan workshop sponsored by Global Rhythms Festival. 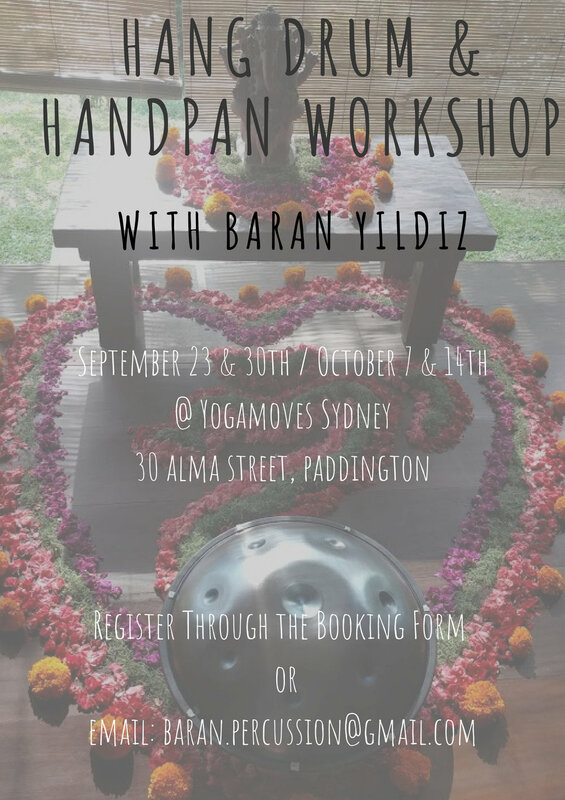 Sydney based multi-percussionist Baran Yildiz will be holding two workshops 13:30 pm and 15:30 pm at the workshop tents on Sunday the 24th September 2017 . Check Global Rhythms Festival website (www.globalrhythms.com.au/) for more details.